No, they aren't. And don't click that link! If you've been the perpetrator, it's really easy to fix. Revoke suspicious or unknown application access. Delete the sent direct messages. My personal favorite is, “Hi some person is making nasty things about you.” Filled with glorious grammatical errors. Each person who clicks this link has most likely thought the message was real, and that there was something terrible about them. Well, there could be something terrible said about you if I listed your name in here! The fix for this is quite simple, but absolutely necessary to prevent the spread and further infection of yourself and others. 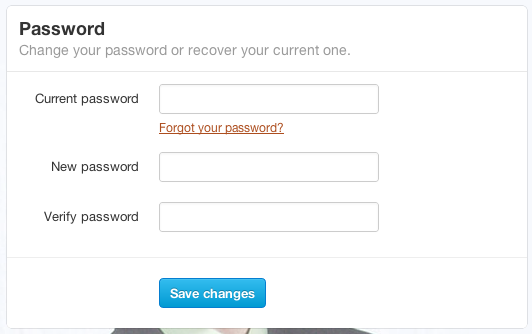 Login to Twitter and change your password here (or Twitter.com > Profile menu > Settings > Password). Some sites will disguise themselves as Twitter and try to get you to login. Always check the domain carefully before you login (twitter.com.sadlfkjsae.com is not your friend). Using a site-based password manager like LastPass can easily prevent this because it won't offer your password on domains that don't match. Visit your Twitter Apps page (or Twitter.com > Profile menu > Settings > Apps) and click “Revoke access” on any app you don't recognize. 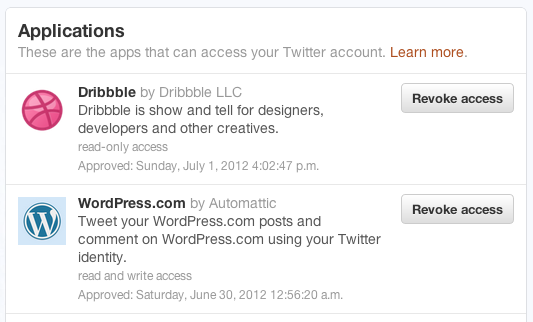 This is a list of apps that you've granted access to your Twitter account. These apps can pull some information about you, tweet or DM for you, and more. If you accidentally revoke something legitimate, you can undo the action, or simply re-authorize the app through its own settings. 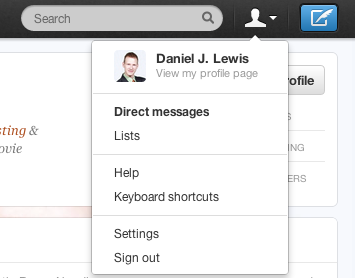 Go to Twitter.com, click your profile menu, then click Direct messages. Delete any malicious messages that were sent from your account. 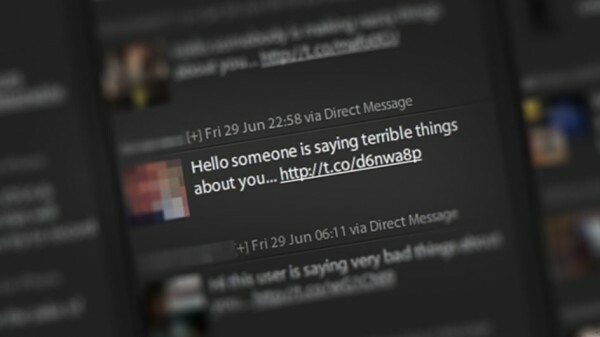 Depending on your followers' Twitter clients, they may never receive your accidental malicious message if you delete it before they see it. I don't know and I really don't care. I just know that it's something very bad, and it will spam all your friends. Please kill this virus now! To be hacked, someone has to be hacking you. When you or someone else clicks a malicious link, there isn't a hacker standing by waiting to get into your account. Instead, this is more like a virus or worm activated by an intentional click. Thus, your Twitter account was compromised, not hacked. That's just my little pet peeve. I do not work for Twitter and I am unable to provide free support for your Twitter problems. Please contact Twitter for help. Thanks, David – this is really helpful. I changed my Twitter password, deleted the offending DM’s, and revoked access by one application. However, clicking revoke access for one other application has no effect. The button never changes to Undo Revoke Access. Any ideas? It could be the way those apps are configured. 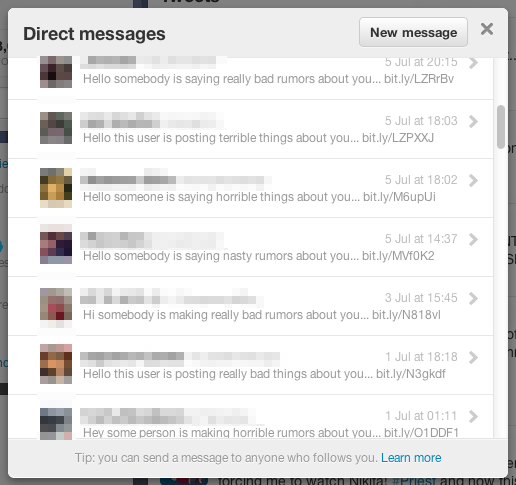 why the direct message cant be deleted and still continue send fake direct message from my account ? You have to revoke the access to your account (step 2). Otherwise, the malicious app will continue using your account to spam. hey i got had a message like that but i can’t login now. what can i do ??? You can’t open the message? That’s fine. That indicates that the sender probably deleted it. The main thing is that you still go through these three steps to ensure you’re not spreading the malicious tweet. That sounds like you used a popular hashtag that was being followed and retweeted by a bunch of bots. My Twitter account is retweeting random stuff and following random people !!! And Idk what to do anymore !!! I already changed my password !! Follow the other instructions in this post, especially revoking access to the applications. And then don’t click on bad links again. My twitter account has been hacked and my email. Rude and weird text messages are now on my twitter page. Twitter does not remove the messages or let me get acces to my twitter account, altough they say don’t panic we can help you. Yeah right, what can i do now? Was it hacked, or did you give away the password? You’ll have to work with your email provider to get your access back. Hello. I got a virus on my Twitter account. This tweet is keep retweeting as I have! I changed my pw. I couldn’t go to apps from my iPhone or iPad. It says sorry something went wrong. Do I have to do that from a laptop or pc? Please help me. Thank you! You need to do this from a PC or browser. Hello & thank you for the steps. Will these steps also stop “fitness” tweets that are posted on my page as if I tweeted them? If the tweets look like they’re coming from you, then you need to go through this process to revoke the malicious access. If I deactivate my Twitter for a little while will that help? Deactivating will only be a temporary solution. You need to go through the above steps. Sounds like you didn’t follow the three steps above. I believe the key to my problem was the app thing, after rewoking them it has stopped. I didn’t pay attention to those because I’ve thought I don’t have any. I’m sorry for the bother, at the end your guide has helped me, so thank you. I shall be more careful in the future. Hello Daniel, I had abandoned my twitter account back in 2013 but recently received some mails saying that somebody was trying to access my account, I thought it was a mistake or twitter was trying to get me back on it. Then I entered my account an somebody was posting in Turkish?! Liking and re-tweeting… I Changed my password (reset) and made it to be double verified by code to my phone (no direct messages or apps). He’s still posting. What do I do? Did you follow all of the steps in my post? Repeat step 2 and revoke access to everything. Also make sure someone else’s phone number isn’t associated with your account. Beyond that, you’ll need to get help from Twitter. A girl told me that she’s logged in my account from her phone and she told me that she didn’t tried to hack me..I did all the steps..and I’ve tried EVERYTHING…and she’s still logged in!What can I do? Did you really do all of these steps, including changing your password and revoking all access? Do you truly know that she’s logged in? I don’t work for Twitter, so these tips in my article are the most help I can provide. hi, ive done all this the app im trying to revoke isn’t showing up, its showing up on my wall as a linked website i think, i removed the link but idk if its still compromised any help? I’m sorry, I can’t help. You’ll need to contact Twitter support. I am currently a night janitor at the College of William & Mary. And some of the IT students played around with my laptop. Now when I log into my Twitter, I can’t see any tweets but 3 or 4 a day. And I currently follow 1,000 people. My Youtube and Facebook also look distorted. Changed all my passwords, yet problem still exists. Been out of school too long to remember anything worthwhile under the INSPECT ELEMENT tab on websites. I’m sorry. As noted, I cannot provide any support. My twitter account was hacked and I lost all my tweets, dms and my followers / following. Is there any way I can get all that info back or revert my account to what it was forty eight hours back? Twiiter help is being of no help! Hello,i remember my experience with hackers i contacted online, i almost lost hope in finding out if my husband was loyal to me and has been loyal in our 20 years marriage, i lost a lot of funds in paying these so called hackers so i made up my mind that if i get scammed again i’ll just forget about finding out what God doesn’t want me to know, Then i saw reviews about ( [email protected] DOT com ) and decided contact him and if and if i hear any stupid excuse won’t contact anybody and just accept that God doesn’t want me to then he proved to me that he isn’t a cheat by working a sample job for me but to my greatest surprise he did the job and sent results to me fast, i was so happy but sad part was i divorced my husband, and i will drop an advise for people who wants any kind of hacking services stopped being scammed by people who impersonate being hackers, contact ( [email protected] DOT com ) for a fast and clean job. Thank me later.